This divinatory system is based on the Periodic Table of the Elements. Sixty of the known stable 92 elements are represented, so while each card is an element, not every element has a card. The deck is organized into four families of 15 elements each, which may be thought of as suits. These families are further divided into groups of 5 cards each. Name of Pharaoh: This family comes from the practice of ancient Egyptian inscriptions to follow the name of the Pharaoh with three additional glyphs, Life, Strength and Health. The Life group includes elements that are fundamental to living beings. The Strength group consists of elements fundamental to both inner and outer strengths. The Health group includes elements which are commonly associated with medicines. Physical World: This family represents the mundane day-to-day facts of living in the world. The groups within this family are Body, Structure and Ornament. The Body group refers to the physical form life takes in the world. The Structure group consists of elements used to create machines, tools and buildings. The Ornament group refers to the needs of cultures to decorate themselves and surroundings. Metaphysical World: This family represents the fear of the unknown. The groups within this family are Chaos, Hell and Void. The Chaos group is the force of entropy. The Hell group represents sources of anguish. The Void group are elements which symbolize the abstract nature of metaphysics. 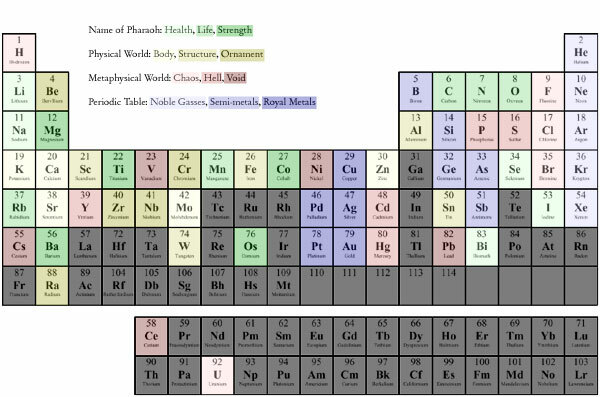 Periodic Table: This family represents the scientific view of the world. The groups within this family are Noble Gases, Semi-Metals and Royal Metals. Noble Gases are stable and non-reactive. Semi-Metals have an air of mystery and defy categorization. Royal Metals are prized as currency and for their innate magical properties.